After adding an item to your cart, you will see this screen. 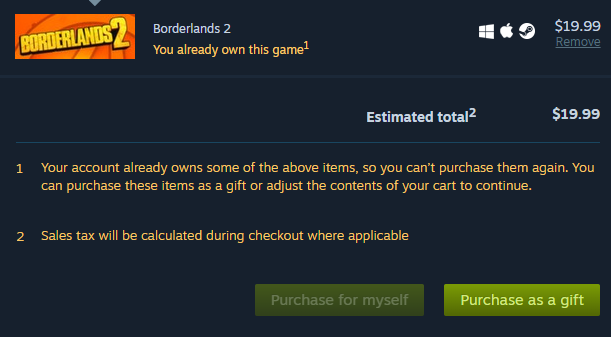 It will let you know you already own it and disable you from purchasing it again, so just select "Purchase as a gift" and follow the instructions. If I have two copies of the same game, can I Gift one of them? How do I gift the rewards of the Bioshock Infinite pre-order? Can i gift one game twice on Steam? What happens if I decline a Steam gift? Can I purchase a game bundle as a gift even though I have already purchased it?